HomeElectricityEnvironmentGadgetsRenewable energySolar energyPWRstation, Upgrading Diesel Gensets to Hybridized Diesel-Solar Microgrids Has Never Been Easier! PWRstation, Upgrading Diesel Gensets to Hybridized Diesel-Solar Microgrids Has Never Been Easier! PWRstation, an emerging Swiss-based designer, and marketer of innovative industrial-grade solar products deliver the world’s first containerized retractable solar Genset, it is a practical “plug and play” alternative to traditional fixed solar installations. Very elegant solution and execution - distributed solar will thrive on productized and lease friendly solutions. 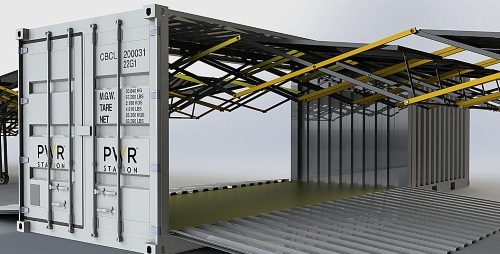 It is deployable virtually on any surface and is ideal for leasing and rental programs! The fully integrated containerized PWRstation Genesis S-Class provides electricity production in urban, commercial, industrial and rural zones. The Genesis S-Class is a scalable, off-grid solution for larger +/- 1 MWp configurations commonly used by such groups as peacekeeping, humanitarian, emergency response agencies and for remote work sites. It is a unique technology that enables highly simplified, ultra-rapid solar deployments of variable duration, w le providing users the ability to easily relocate their solar assets when and where needed. Great. Upgrading diesel gensets to hybridized diesel-solar micro-grids has never been easier. 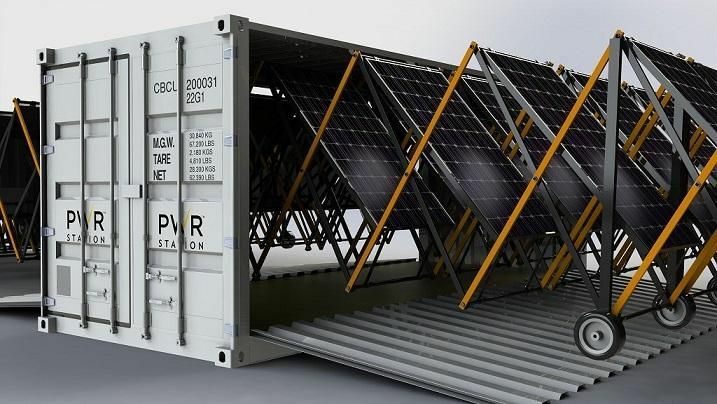 S-10 S-Class containerised solar generator is designed to be transported by truck and can be deployed and connected within approx 30 minutes. It just requires 2 people to deploy and x1 qualified electrician to connect to the grid, battery storage and / or diesel genset - they are currently looking for OEM partners within West Africa to enable more rapid and cost effective supply to the region. PWRstation is working with commercial, industrial, government and non-governmental organizations (NGOs), including such groups as the UNHCR (a PWRstation customer), The World Bank and Photowatt, EDF Energies Nouvelles, PWRstation’s latest customer and strategic partner, as well as a Swiss national commercial realty company.